Gamasutra ninja’ed some charts from something called Game Plan Insights; charts that measure how likely fans are to buy various anticipated titles. I know nothing of their measurement metrics, but as you might expect, all 3 announced/upcoming Blizzard titles rank in the top 15, with Diablo 3 leading the way at #8. 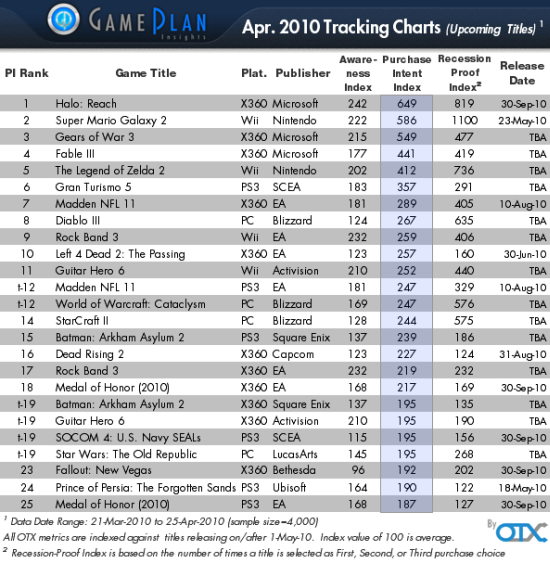 You can see the full chart below, and click to the Gamasutra article for more charts and descriptions thereof. perhaps the diablo 3 beta will be NDA ? RPG don’t need a massive test for race balance. the story should keep secret until release.